CINCINNATI (January 30, 2019) – Cincinnati Zoo & Botanical Garden celebrated two significant birthdays earlier today in the indoor habitat at Gorilla World. The Zoo’s oldest mammal, Samantha, and one of its most famous residents, Gladys, enjoyed cakes made out of fiber biscuits, peanut butter, oats, carrots as candles, raisins and yogurt on top while staff sang Happy Birthday! Gladys, who turned six yesterday, was the orphaned gorilla that came to the Cincinnati Zoo in 2013 at 1 month old to find a foster mother as recommended by the Gorilla Species Survival Plan (GSSP), the body that oversees the 350 gorillas living in North America. Cincinnati was chosen based on its vast experience with baby gorillas, to date enjoying 50 gorilla births. Samantha, the matriarch of Cincinnati Zoo’s family group, was one of the first two gorillas born at the Zoo and is named after Good Samaritan Hospital because its neonate team helped with her early care. She is a mother, a grandmother, a great grandmother, and Gladys’s great aunt! Gorilla World’s indoor habitat, which opened last year, allows visitors to see gorillas year-round. Gorilla World has been closed to guests for some off-season improvements but will reopen this weekend. Visitors can see Samantha, Gladys, Elle, Mlinzi, Jomo, and the whole gang daily from 10 a.m. to 5 p.m., and admission is half price now – March 8! Click here to purchase tickets. There are about 765 gorillas in zoos worldwide including approximately 350 that are managed by the GSSP. Western lowland gorillas are critically endangered in the wild, with approximately 300,000 individuals in the declining population. Due primarily to habitat destruction caused by logging, mineral mining and agricultural expansion, wild gorilla numbers continue to shrink. The bushmeat trade – the killing of wild animals to be used as human food – is also a major threat to the western lowland gorilla population throughout the Central African rainforests. 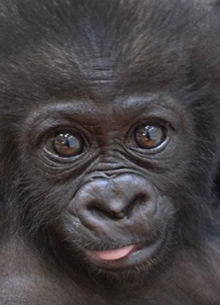 More than 1,000 gorillas are illegally poached for the bushmeat trade each year. The Cincinnati Zoo supports wild gorilla conservation efforts like the Nouabalé-Ndoki Project in the Republic of Congo. 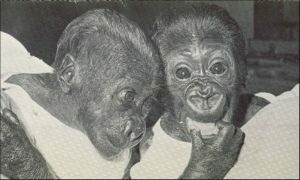 This project includes the Mbeli Bai Study, the longest running research being done with wild western lowland gorillas. Through research, local education programs, publications and documentaries, the Mbeli Bai Study and other gorilla related efforts there are raising international awareness for gorillas and their struggle for survival. For more information, visit www.cincinnatizoo.org.